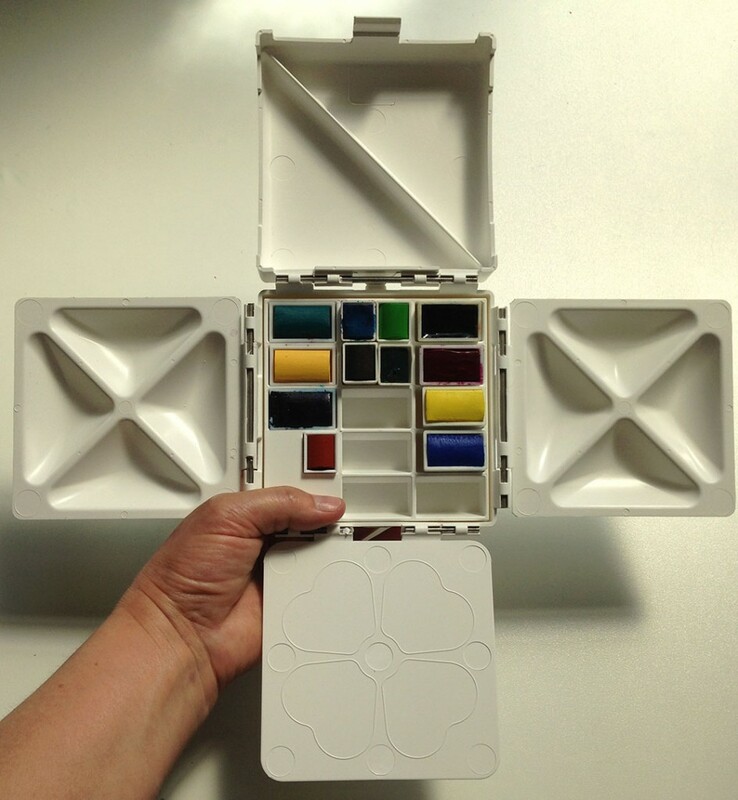 The Cloverleaf Paint Box by watercolour artist and tutor Barry Herniman is now available at Jackson’s Art. 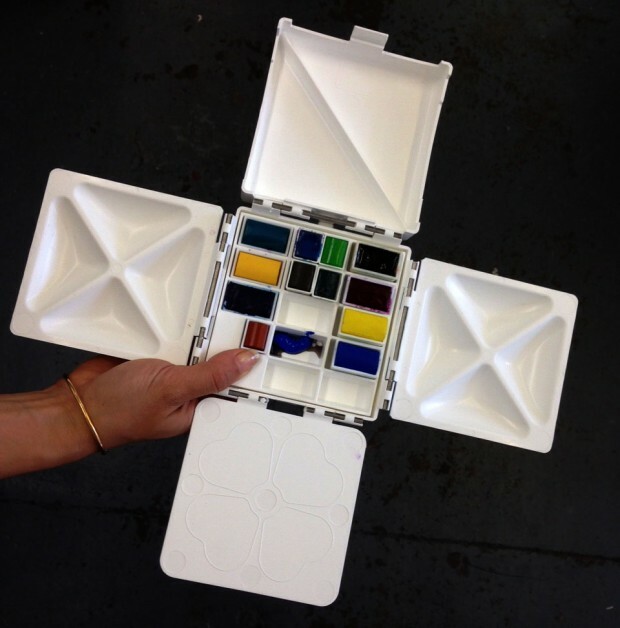 A very cleverly designed watercolour box for painting in the field, the Cloverleaf easily unfolds from a small size (of just 12.5 x 12.5 x 4.5cm), to give 4 good-sized mixing areas. The mixing palettes are stable and solidly attached, not at all fiddly. The plastic is lightweight yet robust. Filled with paint it weighs less than 300 grams. 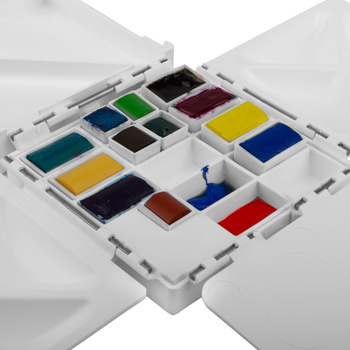 The box is supplied empty, to fill with your choice of paints. Please note that the box does not come with any paint. The paint wells are deep, great for squeezing tube watercolour into. The depth of the wells means you won’t be slopping over when you swirl a wet brush in them. They will fit some makes of full and half pans, but some are a wee bit too large and sit a bit proud, although the box will still close. The paint well area is removable for cleaning. The Cloverleaf paintbox has deep wells for squeezing in your tube paint. Full and half pans will also fit, some better than others. Notice that the Winsor & Newton full and half pans on the left side fit better into the wells. Note: paint is not included. The Cloverleaf paintbox ‘s deep wells are designed for squeezing in your tube paint. It is very easy to hold. 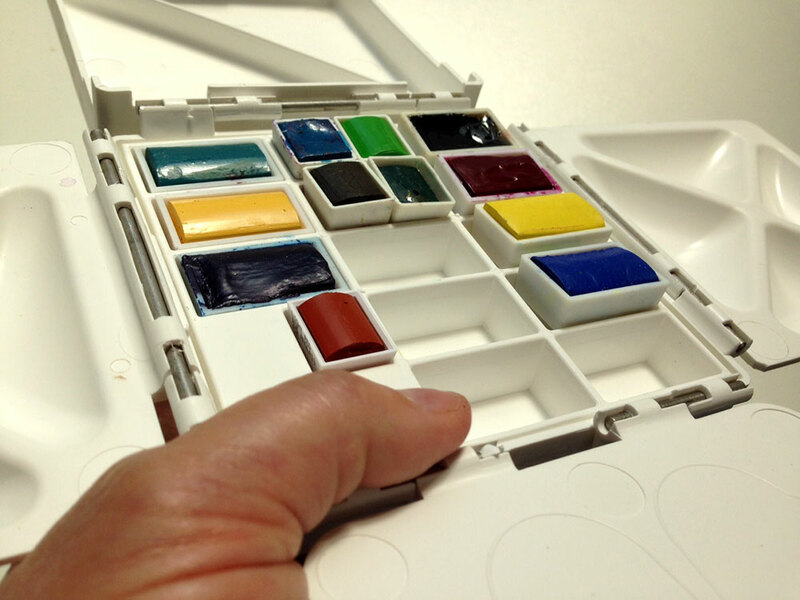 A paint box designed for painting outdoors needs a way to be held in your non-brush hand while working and the Cloverleaf has a simple yet effective feature for this, a flat plate area for your thumb that works if you hold your box in your left or your right hand and if you hold your thumb straight or you crook it. 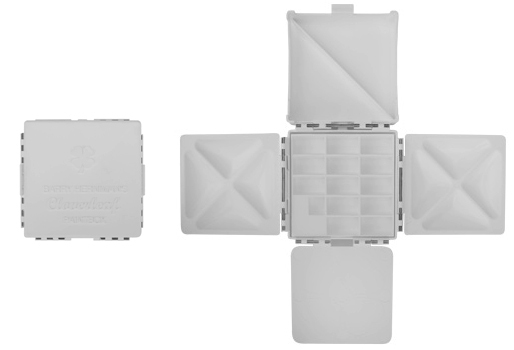 The Cloverleaf paintbox opens up to provide 4 stable mixing areas. A 96-page paperback book by Barry Herniman. The glowing transparency and spontaneity of watercolour makes it an ideal medium for exploring the effects of sunlight, shadows, mist, stormy skies and more. Easy techniques for creating realistic effects are demonstrated in a series of stunning demonstrations. 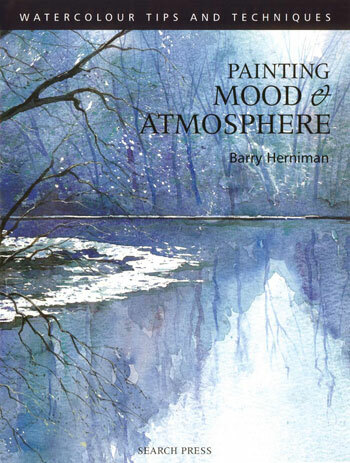 In his enthusiastic and practical manner, Barry Herniman guides you through all the different stages, revealing paintings rich in atmosphere, from tranquil river scenes and misty woodlands to dramatic landscapes and inspiring seascapes. This book is packed with useful tips and easy-to-follow techniques, each accompanied by beautiful paintings to inspire and help improve skills. Artists can learn how to apply these techniques to their own work to create original and unique watercolour paintings that almost spring to life. Barry Herniman is a full time artist who lives in Ross on Wye, England. His first exhibition of watercolours was in 1991 and was predominantly of local Wye Valley scenes. Since then he has travelled quite extensively both home and abroad, gathering reference material and inspiration for his paintings. He runs painting holidays that you can book on his website. Click on the underlined link to go to the current offers on products by Barry Herniman on the Jackson’s Art Supplies website. I have just ordered a Cloverleaf palette! What type of half pans do you recommend that can fit into this palette’s spaces? (You mention above that some fit and some do not.) I would like to customize my palette with a few half pans to extend my color range. Thanks! Great to hear, let us know how you get on with it! The Winsor & Newton pans fit best of the pans I tried. The others, including our empty half pans, fit but sit a bit proud, though they don’t interfere with closing. Most helpful, thanks! I will give those a try… and let you know how it goes. Can’t wait to try my new palette out!